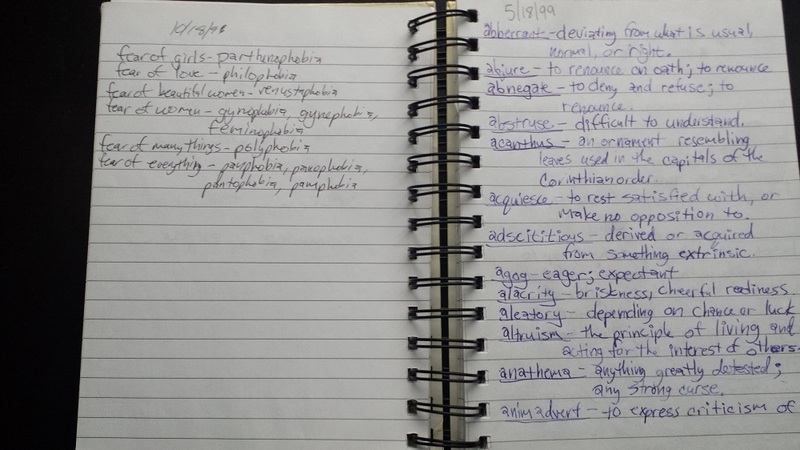 As my junior year of high school was nearing its end, I, on May 18, 1999, (apparently – I’ve always made sure to date everything I write) sat in study hall, intently focused on the dictionary. As others were planning illicit nights and dreaming of the summer ahead, and a football player was allowed to do his Chris Farley impression in front of the entire room, I was reading the dictionary from page one and taking notes. I’ve always been fascinated with words and writing. (Don’t get me wrong, if I had been less awkward and more attractive I would’ve been, I imagine, planning those illicit and fun things as well but the reality being what it was, the opportunities did not present themselves.) I can remember sitting there in that large classroom, surrounded by the green linoleum floor and once white walls that had yellowed, reading each word and definition, looking for ones that in some way struck me so that I could write them down. The particular dictionary I had began with a page of Latin phrases, one of which made it into the front cover of said journal. Of course, most of it was full of terrible, terrible angsty teenage poetry. That will not be reproduced here. 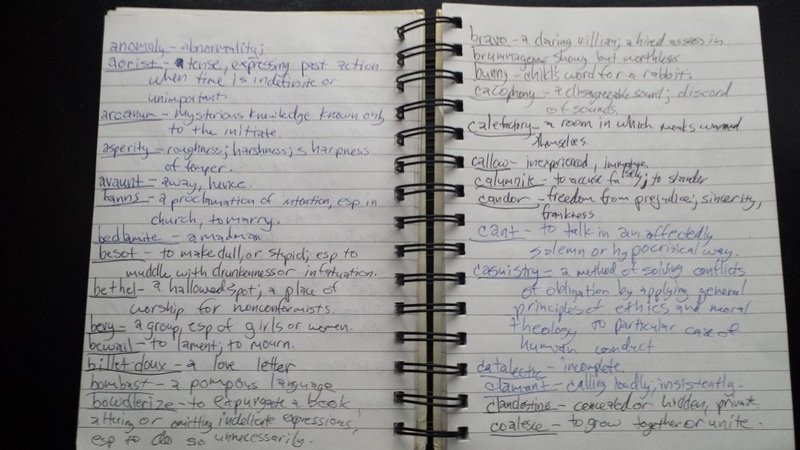 To be honest, I never made it through the whole dictionary – my notes only go through “demarcation” but the fascination with words has never left me. I always have a dictionary within reach of my desk and a special pencil which I use for nothing else but underlining passages in books and checking off words in the dictionary after I have looked them up. It has become a sort of a holy practice that only this pencil is fit for and somehow, in someway as I mark them off the words become a part of me and I feel closer to the language and an increased ability to communicate. I may not remember them (I often find words already marked off when I look them up) but in a way I can’t explain they never leave me. That is why this blog is named Words Will Keep Us Together. While words are intangible and made up, I feel that without them I would cease to exist, that they hold my person together as well as keep us as a species, as friends, as lovers, together. I suppose it comes down to communication and the fear of being unable to communicate (Johnny Got His Gun gave me anxiety attacks all the way through) but there’s something more to words. I love them, especially in the written form. And my ego loves watching my hand scratch out each and every letter in an “I made this” satisfaction. As such I have to physically write out everything with paper and ink or I feel no connection to it whatsoever. Anyone could have typed those words on a screen but writing it first, that wonderful, almost sensual experience, is so rich, so engaging that each character is a small miracle. All those synapses that must fire correctly, the contraction of many muscles, just to write the letter A. I’m sure that sounds absurd to many, but I suppose our passions often do to those looking in from the outside. Growing up I felt unable to communicate what I was feeling most of the time to anyone. All I could do with those often dark and destructive thoughts and emotions was to put them on paper. Have a conversation with myself. And in doing so and in knowing that no matter what happened I could always turn to paper, writing became the most important, most comforting, most reliable relationship I had in the world. And it still is for me, whether it’s drafting a short story or incoherently filling up pages during a bit of mania, it is there and it is what I love and without it I don’t know what I’d do. I found that last two parts particularly interesting and are most applicable to the discussion here, but the entire series is well worth a watch. If you have Hulu Plus you can stream it here. It does not appear to be on YouTube, but there is this great video of Stephen Fry discussing the documentary and the topics it looks at. Enjoy. I loved him in the Jeeves-Bertie series! Me too! It’s hard for me to see him and not think of Jeeves. Classic stuff.